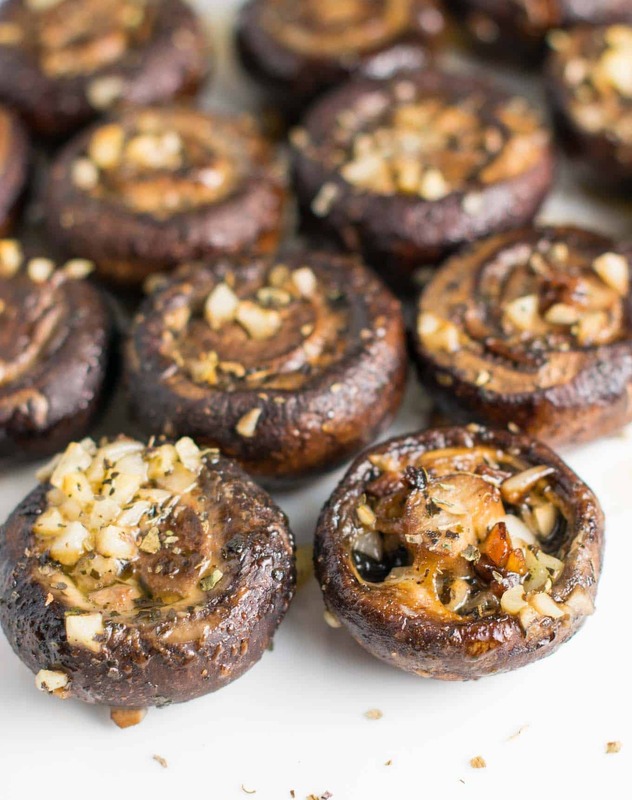 These garlic butter mushrooms are one of my favorite mushroom recipes. I could just eat these and my stuffed portobello mushrooms for a meal and be in heaven! Mushrooms are one of my ultimate favorite vegetables. Some people love them, and some people hate them, but I have found that I am most definitely on the LOVE side of the spectrum. If you’ve checked out many recipes on my blog, you will tend to see a LOT of recipes with mushrooms. Mushrooms in pasta, mushrooms in mexican food, and mushrooms for breakfast. I can never get enough! I’m in trouble when Kroger has mushrooms on clearance, as I tend to buy them all. I can’t help myself! People that don’t like mushrooms? Those are the people I understand the least. More for me please! 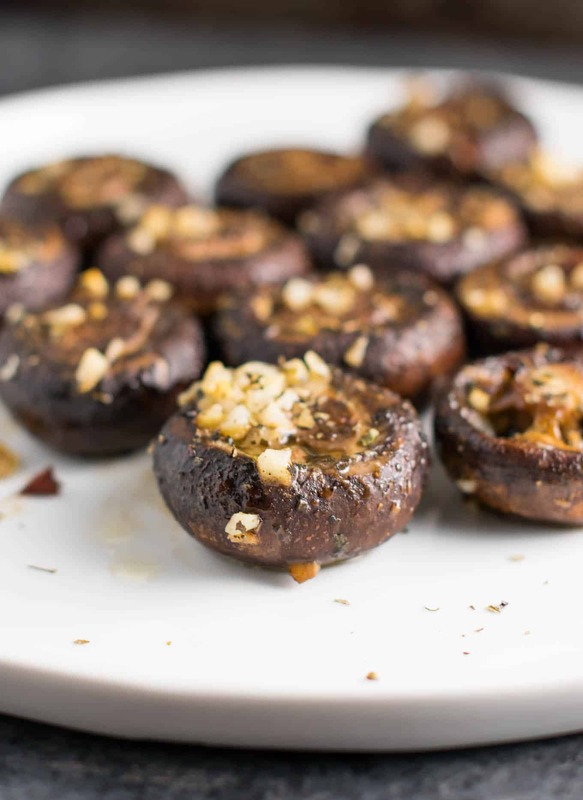 These easy roasted garlic butter mushrooms are ready for the oven in less than 10 minutes and make a great healthy side to dinner or an appetizer for a party. I used baby bella mushrooms for mine, but white mushrooms would work as well. Whatever you can find! You just need whole mushrooms. Fresh minced garlic is key here, so be sure not to skimp – that’s where all of the flavor is! I love that these mushrooms are made with all ingredients you probably have on hand. They’re a back pocket staple recipe for me. Take me to the garlic butter mushrooms recipe! If you want to go straight to the recipe, simply scroll to the bottom of this post where you will find a printable recipe card with ingredients and instructions. I suggest reading through the post where you will find step by step instructions, similar mushroom recipes, and my tips and tricks! Trim the ends of your mushrooms and place them cap side down in a baking dish. Add your butter and minced garlic to a microwave save bowl and cook for 3o seconds, until butter is melted. Add in your salt, pepper, and dried basil to the butter, and stir to combine. Drizzle the garlic butter over the tops of the mushrooms evenly. Bake at 425 degrees for 25 – 30 minutes, until sizzling and juicy! Garlic is so healthy for you and so delicious. If a recipe calls for 2 cloves of garlic, I tend to use 6 or 7 cloves. You can never have too much garlic in my opinion! 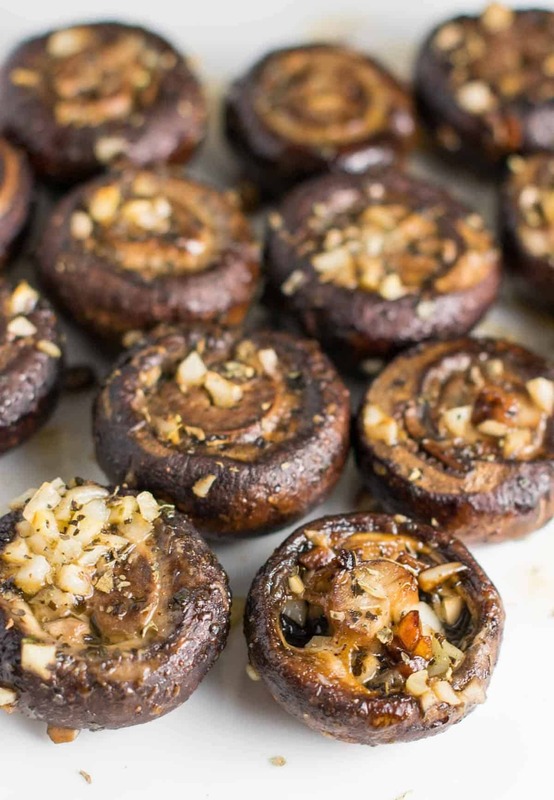 Butter + fresh minced garlic = mushroom recipes heaven! I just wish I had a pan of these to eat right now. These were so juicy and delicious and full of flavor. I used 6 cloves of minced garlic and probably could have used even more. If you’re afraid of a lot of garlic, you can cut back to 3 or 4 cloves, but I really recommend more as it gives the mushrooms so much flavor! I haven’t included reheating instructions, as I’m pretty sure you won’t be needing them! Ours were gone in minutes. My husband and I polished off the whole batch in no time at all and my one year old even loved them too! p.s. 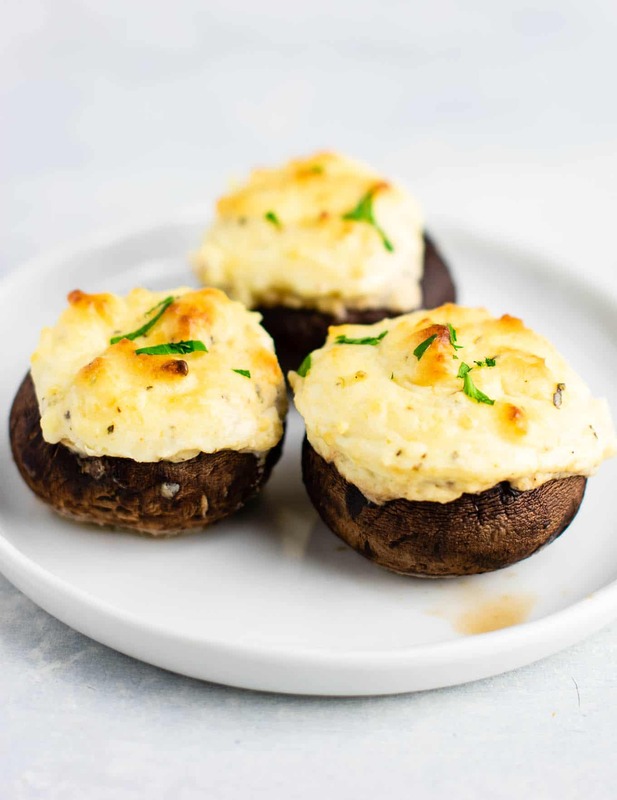 If you love mushrooms, be sure to check out my Stuffed Portobello Mushrooms (pictured below) They are another one of my favorite mushroom appetizers/side dishes! Love mushrooms? Here are some reader favorite mushroom recipes! Easy juicy roasted garlic butter butter mushrooms recipe. 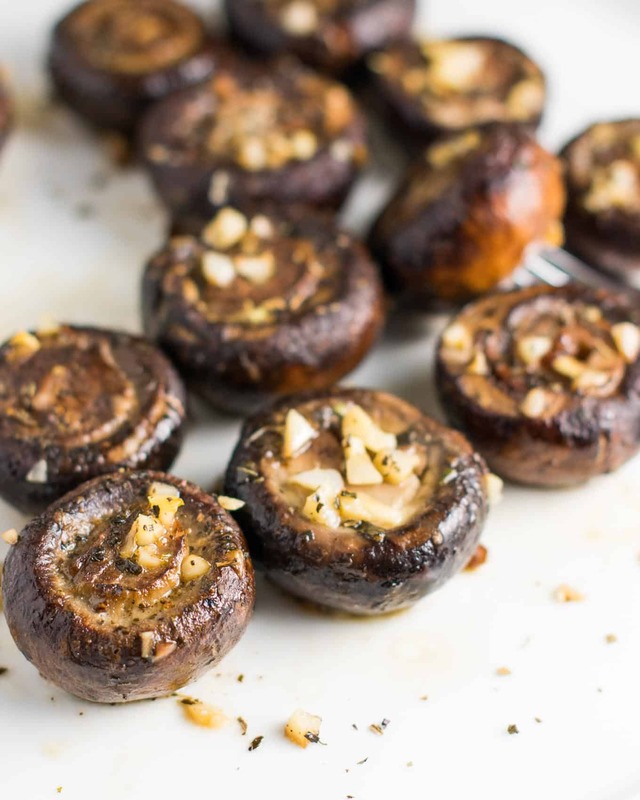 Mushroom lovers will love this side dish! My wife made these and they were amazing!